[T]he final text is…distinguished by its “creative ambiguity”…imbued with baptismal theology and the branch theory…and moved slightly, but consciously, away from the principle of exclusivity and towards the principle of inclusiveness. Original Text in Greek: Ναυπάκτου κ. Ἱεροθέου: Οἱ ἀποφάσεις τῆς Ἱεραρχίας τῆς Ἐκκλησίας τῆς Ἑλλάδος γιὰ τὴν «Ἁγία καὶ Μεγάλη Σύνοδο» καὶ ἡ κατάληξή τους. Translated, for the Holy Metropolis of Nafpaktos and St. Vlassios, by Anastasios Filippides. According to the Fathers of the Church, the term person was attributed to the Triune God, while throughout patristic literature the biblical term human being (anthropos) is used for humans in the theological meaning of human beings created in the image and likeness of God. When sometimes the Fathers use the term hypostasisfor human beings, they use it based on the Bible and not on philosophy. The way of granting autonomy to a Church Province. Because the granting of autonomy by its Mother Church to a province may cause schisms, divisions and separatist deviations, it was proposed to maintain unchanged the ecclesiastical position which was decided by Synodical-Patriarchal Tomes or Patriarchal-Synodical Acts. This was proposed with a view to Church unity and to avoid schisms. The unity of the Church is a given fact, because the Church is the Body of Christ and is not separated from the Head, that is, from Christ. Consequently, those who at various times move away from the faith and worship of the Church are outside the Church and need to return to it. This is the aim of theological dialogue, because we confess: “as the Prophets have seen, as the Apostles have taught, as the Church has received, as the teachers have set forth in dogmas … thus do we believe, thus we speak, thus we preach Christ our true God,” and we proceed “according to the God-inspired theologies of the saints and the devout mind of the Church.” The principle of exclusivity cannot fall victim to the principle of inclusiveness, which undermines the given fact of the unshakable unity of the One Church. The Hierarchy of the Church of Greece, with absolute faith in the teachings of the Prophets, Apostles and Fathers, and with respect for the Conciliar polity of the Orthodox Church, has studied thoroughly the proposals of the Standing Synod one by one, in a spirit of unity, responsibility and seriousness, and with unanimity on most points and an absolute majority in others, has made corrections to the texts presented, and additions where needed, so that these are the final decisions of our Church with regard to these texts. It is known that the Holy and Great Council will be held from the day of Pentecost until the Sunday of All Saints. This means that the Bishops and other Clergy and laity who will represent the Church of Greece at this Council, will try, together with the other Churches, to express the experience and faith of the mystery of Pentecost and the confession of our Saints, which is a continuation of Pentecost in history. In what follows the decisions of the Hierarchy of the Church of Greece on the three texts will be presented, with some theological EXPLANATORY COMMENT to illustrate their value, together with an indication of which ones were approved or rejected during the meetings of this Council in Crete. 3. As a presupposition for a wider co-operation in this regard the common acceptance of the highest value of the human person may be useful. The Orthodox Churches are called to contribute to inter-religious understanding and co-operation to eradicate fanaticism of every kind, establish reconciliation among peoples, as well as help freedom and peace prevail throughout the world in order to serve humankind, irrespective of race and religion. Of course, such cooperation excludes both syncretism and the attempts of any one religion to impose itself on others. Indeed, throughout the period of its historical life, Orthodoxy served with consistency, continuity and zeal the majesty of the human person in the absolute and universal sense with which this was connected in the context of Christian anthropology. The human being, as the climax and summary of divine creation and as having been created in the image and likeness of the Creator, has been for the Orthodox Church the whole content of its mission to the world and the history of salvation. I think the discussion has indicated that there is a problem with the term ‘human person’, and as it only occurs seven times in the text it would seem preferable to delete it, as the Synod of the Church of Greece has maintained, and the Primate of the Church of Jerusalem and the Church of Jerusalem agree. …that the theological, productive discussion be continued between fine and prolific theologians, such as the Metropolitans of Pergamon and Nafpaktos. We appreciate them, we admire how they produce those books one after the other, which are translated into foreign languages. We, therefore, as the Church of Constantinople, are in favour of leaving the text as it stands. Freedom and Responsibility. 1. Freedom is one of God’s greatest gifts to the human being as a specific bearer of the image of the personal God and as a member of a community of persons who, through the unity of the human race, reflect by grace the life and communion of the Divine Persons of the Holy Trinity. Freedom and Responsibility. 1. Freedom is one of God’s greatest gifts to the human being. Ecclesiastical Provinces for which a Patriarchal Tomos or Act has been issued cannot apply for autonomy, and their existing ecclesiastical status is maintained unshakeable. For each Autocephalous Church a Tomos has been issued, which means that by this reasoning no part of any Autocephalous Church could claim autonomy, since for all a Tomos or an Act has been issued. However, with this thinking, autonomy is prohibited to all. This significant comment disappeared in the consolidated text signed by the Primates of the Churches in Geneva in January 2016! These reasons prompted the Standing Holy Synod and the Hierarchy of the Church of Greece to bring the whole text into line with the meaning of the title, “Relations of the Orthodox Church with the rest of the Christian world”. Among other things, they decided to use the phrase “Christian Confessions and Communities”. The Orthodox Church acknowledges the historical existence of other Christian Churches and Confessions not in communion with her. That is, “is aware of” became “accept”, the term “historical existence” became “historical name” and the word “heterodox” was added to Churches. With this amendment we achieve a conciliar decision which for the first time in history limits the historical context of the relations with the heterodox not to the existence, but ONLY to their historical name as heterodox Christian Churches or Confessions. The ecclesiological implications of this change are obvious. Not only do they not adversely affect in any way the age-old Orthodox tradition, but rather they protect Orthodox ecclesiology in a very clear way. The prospects for conducting theological dialogues between the Orthodox Church and other Christian Churches and Confessions are always determined on the basis of the canonical criteria of the already established Church Tradition (Canon 7 of the Second Ecumenical Council and Canon 95 of the Quinisext Ecumenical Council). The prospects for conducting theological dialogues between the Orthodox Church and other Christian Confessions and Communities are always determined on the basis of the principles of Orthodox Ecclesiology and the canonical criteria of established Church Tradition, according to the sacred canons of the Ecumenical Councils and of the Local Councils recognised by them, such as Canons 46, 47 and 50 of the Holy Apostles, 8 and 19 of the First Ecumenical Council, 7 of the Second Ecumenical Council, 95 of the Quinisext Ecumenical Council, and 7 and 8 of Laodicea. It is clarified that, when applying economy by admitting the heterodox by Libel and Holy Chrism, this is not to imply that the Orthodox Church recognises the validity of their Baptism or their other Sacraments. The phrase “with the other Christian Confessions and Communities” was not accepted, because the Church of Greece herself had already produced a new proposal on this issue. The addition of Canons 46, 47 and 50 of the Holy Apostles, 8 and 19 of the First Ecumenical Council and 7 and 8 of Laodicea, the contents of which were mentioned above, was not accepted. The proposal of the Hierarchy of the Church of Greece that “when applying economy by admitting the heterodox by Libel and Holy Chrism, this is not to imply that the Orthodox Church recognises the validity of their Baptism or their other Sacraments” was not accepted. The Orthodox Church considers all efforts to break the unity of the Church, undertaken by individuals or groups under the pretext of maintaining or allegedly defending true Orthodoxy, as being worthy of condemnation. As evidenced throughout the life of the Orthodox Church, the preservation of the true Orthodox faith is ensured only through the conciliar system, which has always represented the competent final judge in the Church on matters of faith. The Orthodox Church considers all efforts to break the unity of the Church, undertaken by individuals or groups under the pretext of maintaining or allegedly defending true Orthodoxy, as being worthy of condemnation. As evidenced throughout the life of the Orthodox Church, the preservation of the true Orthodox faith is ensured [the word only was deleted] through the conciliar system (Canons 6 of the Second Ecumenical Council and 14 and 15 of the First-Second Council).” At the same time it proposed deleting the phrase “which has always represented the competent final judge in the Church on matters of faith. Because it is possible that this text may be misinterpreted by some people and that the Holy and Great Council may be thought to accept that infallibility in the Orthodox Church is expressed by the Bishops in Council, without taking into account the whole Orthodox Clergy and the people. In this spirit, the Orthodox Church deems it important for all Christians, inspired by the common fundamental principles of our faith, to attempt to offer with eagerness and solidarity a response to the thorny problems with which the contemporary world challenges us, based on the ideal prototype of the new man in Christ. We pray that all Christians may work together so that the day may soon come when the Lord will fulfil the hope of the Orthodox Churches and there will be ‘one flock and one shepherd’ (John 10:16). We pray that all Christians may work together so that the day may soon come when the Lord will fulfill the hope of the Orthodox Church that she may gather within her all those who are scattered and there will be ‘one flock and one shepherd’ (John 10:16). This proposal was made to rule out the branch theory, according to which the unity among Christians has been lost and therefore Christians, including the Orthodox, are the individual branches of the tree struggling for their unity. The proposal of the Church of Greece was rejected and was not included in the text. 3. The Orthodox Church, in her unity and catholicity, is the Church of Councils, from the Apostolic Council in Jerusalem (Acts 15:5-29) to the present day. The Church in herself is a Council, established by Christ and guided by the Holy Spirit, in accord with the apostolic words: “It seemed good to the Holy Spirit and to us” (Acts 15:28). Through the Ecumenical and Local councils, the Church has proclaimed and continues to proclaim the mystery of the Holy Trinity, revealed through the incarnation of the Son and Word of God. The Conciliar work continues uninterrupted in history through the later councils of universal authority, such as, for example, the Great Council (879-880) convened at the time of St Photios the Great, Patriarch of Constantinople, and also the Great Councils convened at the time of St Gregory Palamas (1341, 1351, 1368), through which the same truth of faith was confirmed, most especially as concerns the procession of the Holy Spirit and as concerns the participation of human beings in the uncreated divine energies, and furthermore through the Holy and Great Councils convened in Constantinople, in 1484 to refute the unionist Council of Florence (1438-1439), in 1638, 1642, 1672 and 1691 to refute Protestant beliefs, and in 1872 to condemn ethno-phyletism as an ecclesiological heresy. The Delegation of the Church of Greece succeeded in including the views of the Hierarchy in the first text on the ontology of the human person. Although the word “person” remained in the text along with “human being” for further discussion, everything was deleted that related to the ontology of person in connection with the Triune God, namely, that the human being is a bearer of the image of the personal God, and that the communion of persons reflects by grace, through the unity of humankind, the life and communion of the divine persons in the Holy Trinity. In the text relating to the issue of autonomy, the Church of Greece received the assurance of the Ecumenical Patriarch that the existing arrangements for the New Lands will continue to apply, that is to say, that these Metropolises belong canonically to the Ecumenical Patriarchate but were put under the guardianship of the Autocephalous Church of Greece for their administration, that the status quo will remain and that autonomy will not be granted to these regions and other areas for which a Tomos or Act has been issued. In the most fundamental text referring to the relations of the Orthodox Church with the rest of the Christian world, after the change of the decision of the Hierarchy on the main point, and the submission of a new proposal by majority vote by the Delegation of the Church of Greece, without authorisation from the Hierarchy, the other basic proposals concerning the validity or otherwise of the Baptism of other Christians and prayer for their return to the One, Holy, Catholic and Apostolic Church were not adequately supported. His Eminence Metropolitan Hierotheos (Vlachos) of Nafpaktos and Agios Vlasios (also Ierotheos) serves the Metropolis of Nafpaktos and Agios Vlasios in the Church of Greece. 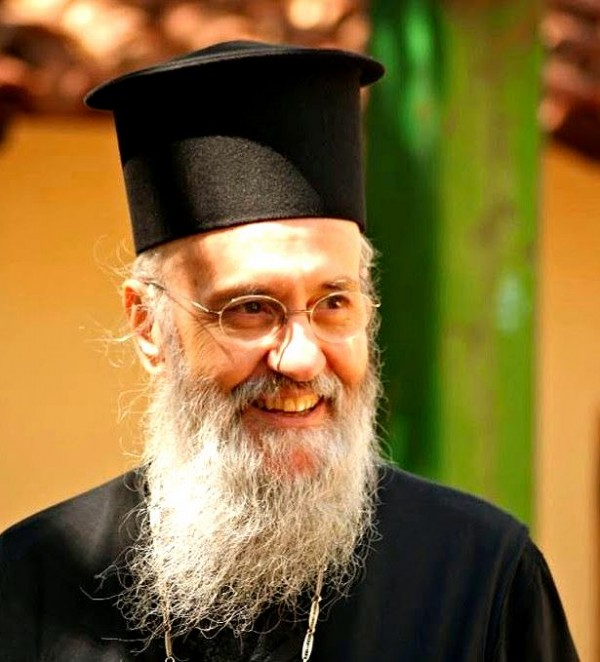 He has been Metropolitan of Nafpaktos since 1995. It has to do with motivations. “Person” can and will be construed so as to legitimize pathologies of the personality. That is probably its intended effect and that is why traditionalists are wary. Better to cut it off along with the rest of the quasi-heretical nonsense. that subject to a vote? Was the EP attempting a sort of Papal prono0uncement? Christ did not establish a multipliciry of ministeries each with its own belief systems and rituals. Christ left His Church in the hands of the Apostles and their successors who under the guidance of the Holy Spirit would establish the church in all Truth and the gates of hell would not prevail against it. Christ warned of wolves that would attempt to derail the Church. These came in the form of heresies. A heresy that gained momentum became a movement that broke away from the Church or was excommunicated from the Church forming communities/churches separated and apart from the Church. A movement away from the Church is a movement away from Christ, the Founder, Head and Life of the Church. A movement away from the Church is a movement away from the Life of the Holy Spirit. Now is it conceivable that such a heretical church admimisters valid Sacraments? What is inconceivable is that if a heretical church does have valid Sacraments the Church rejects and does not partake of these Sacraments. Because the Church does not participate in the sacramental services of heretical churches the inference is that these churches, and this includes the Roman Catholic church, do not have valid Sacraments. They have a form of baptism akin to that of John the Baptist and worship akin to the old Judaic rites all precursors to the worship, rites and Sacraments of the Church.